Each inventory transaction, such as a purchase receipt or a sales shipment, posts two entries of different types. Reflects the change of quantity in inventory. This information is stored in item ledger entries. Accompanied by item application entries. Reflects the change of inventory value. This information is stored in value entries. One or more value entries can exist for each item ledger entry or capacity ledger entry. For information about capacity value entries related to the use of production or assembly resources, see Design Details: Production Order Posting. In relation to quantity postings, item application entries exist to link inventory increase with inventory decrease. This enables the costing engine to forward costs from increases to the related decreases and vice versa. For more information, see Design Details: Item Application. Item ledger entries, value entries, and item application entries are created as a result of posting an item journal line, either indirectly by posting an order line or directly in the Item Journal window. At regular intervals of dynamically, value entries that are created in the inventory ledger are posted to the general ledger to reconcile the two ledgers for financial control reasons. For more information, see Design Details: Reconciliation with the General Ledger. The following example shows how item ledger entries, value entries, and item application entries result in general ledger entries. You post a purchase order as received and invoiced for 10 items with a direct unit cost of LCY 7 and an overhead rate of LCY 1. The posting date is 01-01-20. The following entries are created. Next, you post a sale of 10 units of the item with a posting date of 01-15-20. At the end of the accounting period, you run the Post Inventory Cost to G/L batch job to reconcile these inventory transactions with the general ledger. For more information, see Design Details: Reconciliation with the General Ledger. For information about the general ledger accounts that are mentioned in the example, see Design Details: Accounts in the General Ledger. 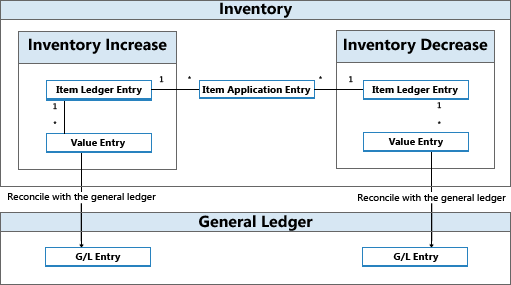 The following tables show the result of reconciling the inventory transactions in this example with the general ledger. The posting date of the general ledger entries is the same as for the related value entries. The Cost Posted to G/L field in the Value Entry table is filled. The relation between value entries and general ledger entries is stored in the G/L - Item Ledger Relation table. Capacity and resource ledger entries represent the time that is posted as consumed in production or assembly. These process costs are posted as value entries to the general ledger along with the involved material costs in a similar structure as described for item ledger entries in this topic. For more information, see Design Details: Assembly Order Posting and Design Details: Production Order Posting.